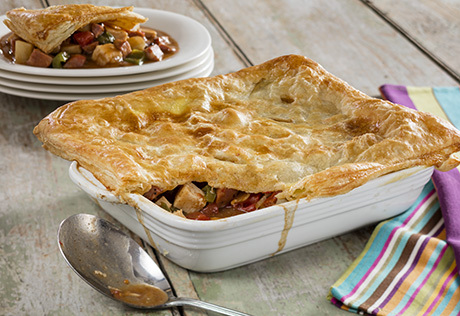 Alternate Preparation: For a lattice-topped pot pie, prepare the turkey mixture as directed above, spoon into an 8x8x2-inch baking dish and bake at 400°F. for 30 minutes or until hot. Unfold the pastry sheet on a lightly floured work surface. Cut the pastry sheet into 9 (1-inch strips). Weave the pastry strips into a lattice. Place the pastry lattice onto a parchment paper-lined baking sheet. Brush with a mixture of 1 egg and 1 tablespoon water. Bake for 15 minutes or until golden brown. Place the pastry lattice on the hot turkey mixture.